"Yet another wonderful read from one of the best travel writers of his generation. 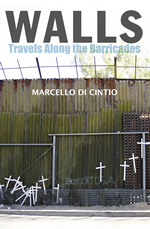 In Walls , Marcello Di Cintio tells compelling and engrossing stories with his customary mix of vivid detail, a strong sense of history, a lovely sense of humour and, above all, a fascination with the human race in all its contradictions." --Margaret MacMillan, historian and author, "Paris 1919: Six Months that Changed the World"
In December 1999, hot with millennial fever and desperate to be somewhere 'important' when the clock turned on 2000, I traveled to Jerusalem. On Christmas Eve during that trip, I walked from Jerusalem to Bethlehem. The journey was far less biblically-epic than it sounds. The two cities were linked by a busy highway, not shepherds' trails, and the whole stroll took a little less than two hours. There was nothing memorable about the journey except that the two cities seemed to merge at their borders. Jerusalem and Bethlehem were not sister cities as much as conjoined twins. I couldn't tell where one city ended and the other began. When I returned to the region in 2004, Israel's newly-erected "security barrier" had erased this ambiguity. Tall slabs of concrete edged Bethlehem and, for the first time in centuries, clearly defined Here from There. The international community justifiably derided the West Bank Wall. Detractors accused the Wall of being immoral and illegal. Discussion over the barrier drew attention to other such barricades standing elsewhere in the world. Some were older than Israel's wall; others were new and seemed to be inspired by it. Coming from Canada where we have no such physical barriers - or none I knew of at the time - I grew fascinated by the idea of walls. 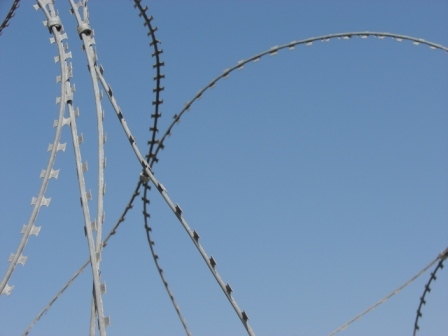 I decided to travel along the barricades and write about them. Originally, I planned to visit fifteen 'walls' on five continents. Among them were the fortified borders between Belarus and Lithuania, Iran and Pakistan, Pakistan and India, Uzbekistan and Kyrgyzstan, and the tri-border area between Brazil, Paraguay and Argentina. I wanted to visit the DMZ between the Koreas, the gated communities in Johannesburg and the fence around Sharm el-Sheikh. I was a few mouse clicks from purchasing a costly air ticket to Botswana before I discovered, just in time, that the fence along the border with Zimbabwe had been torn down. In addition to the travel, I wanted to examine the cultural history of walls and wall-building. I would reference the Wall in Dr. Seuss' Butter Battle Book and in Shakespeare's A Midsummer Night's Dream. I even planned on writing about the invention of barbed wire and visiting the Devil's Rope Museum in McLean, Texas. I thought my itinerary was ambitious and impressive. My literary agent found it absurd and impossible. The plan would be prohibitively expensive and produce an enormous tome that I wouldn't be able to lift, much less convince anyone to publish. I relented to reason and limited my travels to eight walls. My travels began along the berm in the Western Sahara, the world's longest still-functional security barrier, and ended at the rusted and mostly-forgotten fence dividing Montreal's Park Extension neighborhood from the Town of Mount Royal. In between, I traveled to the fenced Spanish enclaves of Ceuta and Melilla in North Africa, the India-Bangladesh borderlands, Israel and Palestine, the divided capital of Cyprus, the U.S.-Mexico border, and Belfast. By the time I was finished, even this reduced itinerary felt absurd. Over a three and a half-year span I spent 46 weeks away from home, took 37 flights and 10 train trips, used 11 forms of currency and photographed more graffiti and barbed wire than I care to recall. I also managed to squeeze in a 10-month writing residency at the University of Calgary and - most impressively, I think - father my first child. I was exhausted. The book project, though, hit a narrative crisis long before the travel itself wore me down. After my first 'wall journeys' in North Africa, I met with my friend and fellow author Wayson Choy while he visited Calgary. I told Wayson about my walls book idea, about the places I'd seen and those I planned on travelling to. I told him how the granting bodies had been generous with their support and how excited I was about the project. Wayson listened. 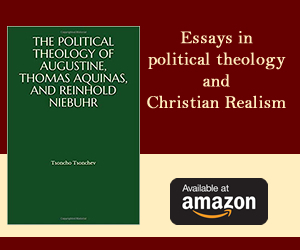 Then he asked, simply, "What is the book about?" "It's about walls," I said. "But what is the story?" I froze. I had no idea. The morning after I met with Wayson I contacted my agent and told her to stop shopping the proposal to publishers. I needed to figure out what the book was about before any publisher would want to buy it. I kept on traveling, and instead of focusing on the walls themselves, I started to turn my attention to the people that lived alongside them. I met Saharan refugees and Palestinian farmers. 'Illegal' migrants from Africa, Mexico, and the Punjab. Former militants. Native elders. American gunslingers. Soldiers, poets, artists and activists. The more people I engaged with, the more the narrative started to emerge. What started out as a shallow travelogue of fortified lines turned into a collection of stories of those who live in the shadows of the walls. The story was about those who, in some way or another, subverted the barriers built to enclose or exclude them. My narrative, then, was one about survival and, occasionally, victory. I had my story. After another year of writing, all I needed was an ending. The way I saw it, I could conclude the book two ways. I could remind the reader that even though humanity seems genetically predisposed to build barriers and erect fences, we are also destined to tear them down. I could claim the human impulse to defeat the walls is greater than the impulse to build them. However, the opposite was just as true: though we may be compelled to tear down the walls that divide us, we are also compelled to keep building them. I rewrote my final paragraphs several times, wavering from the pessimistic to the hopeful. In the end, I deferred to the brave men and women I'd met who challenged and defeated their walls. I deferred to Jeffrey James who climbed the barbed wire in Ceuta, and to Patricia who tunneled under the U.S.-Mexico border to make a better life for her children. I deferred to Glenn Weyant, a Tucson musician who 'played' the border wall and transformed it into music. In the end, I opted for hope. Calgary writer Marcello Di Cintio's first book, Harmattan: Wind Across West Africa, won the Henry Kriesel Award for Best First Book. His second book, Poets and Pahlevans: A Journey Into the Heart of Iran, won the Wilfred Eggleston Prize. He has also written for numerous magazines, journals, and newspapers, including The Walrus, EnRoute, Geist, Reader's Digest, Afar, and The Globe and Mail. on Tuesday, September 18, 12 PM at Marianopolis College, 4873 Westmount Ave.